Situated on the picturesque Annisquam River waterway, this beautifully restored 1900 Victorian Inn and Motel features 26 uniquely decorated rooms, an on-site restaurant, and a full bar. 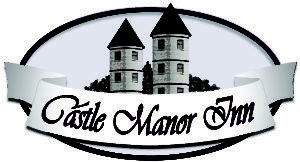 The Castle Manor Inn offers a comfortable and relaxing stay not far from downtown Gloucester, the harbor, and other local attractions. Stay in one of the 10 rooms in the main historic inn or in one of the spacious and comfortable rooms in the Motor Lodge. All rooms have private bathrooms and other amenities. Free Wi-Fi is available in certain areas of the property. Unwind and take in the breathtaking water views from the Main Room of the historic inn, from the gorgeous Victorian deck, as well as from their expansive grounds. The Sea Glass Restaurant serves a fresh and unique cuisine that will delight your senses and is open for breakfast and dinner for guests and the public to enjoy. The Inn’s full bar and a heated outdoor terrace provide additional dining options throughout the year. The grounds and deck at Castle Manor Inn offering exquisite water views are the perfect setting for small functions or large weddings. The owners and staff are friendly and highly-trained and will ensure that your visit to the Castle is the best.